I could tell you what this book is about, but if you've read my earlier reviews of part one, The Girl with the Dragon Tattoo, and the second in the trilogy, The Girl Who Played with Fire, then you'll pretty much get the general vibe. If not, here's a brief synopsis: crack investigative journalist finds himself defending crazy lone female punk researcher as she is set up as the culprit for several murders. Relentless scenes of extreme violence ensue with Lisbeth (punk researcher) managing to incur the wrath of dodgy eastern European and Swedish hoodlums galore as she travels around Sweden seeking revenge. Throw in a history lesson on the Swedish secret service and that pretty much sums it up. The final part of the Millenium trilogy is not, in my humble opinion, as good as part two, The Girl Who Played with Fire. There's that great big chunk of history of the secret service to contend with. Persevere, as it picks up once you get through the early part of the book. Larsson ratchets up the tension to almost unbearable levels later on. Maybe he wanted to numb us senseless with the vagaries of the Swedish Civil Service so we'd appreciate the action more. We'll never know. There are a few insights I've gained from the series that I'd like to share with you. According to Larsson Swedes like coffee. They drink it A LOT. In fact, I'm surprised they can function at all. Cafetiere after cafetiere gets downed at all times of the day and night. Apparently they sleep. Although I find that hard to believe. If I drank that much coffee, I'd be attached to a drip in hospital suffering from severe palpitations. Apparently all women want to sleep with Mikael Blomqvist. He is irresistible. In a starting-to-go-to-seed-middle-aged-man sort of way. He can't help it. And it doesn't really mean anything. Plus, he's always good friends with them afterwards. So that makes it OK. But Blomqvist is the nice guy on the block. And the rest? Well, I've never read about such a motley crew of men, with such a deep seated hatred and contempt for women. From Nazi-loving rapists to Russian spies. Utterly contemptible and stomach churning stuff. It does't paint a pretty picture of Scandinavian society. Something I discovered recently. 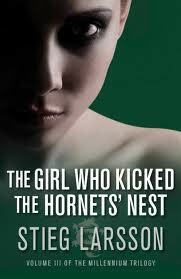 The children's character written by Swedish author Astrid Lindgren (who's a feisty ginger-haired girl with mis-matching stockings who is as strong as 10 men and won't take any sh*t from a grown-up) was an inspiration for Larsson when he was developing the character of Lisbeth Salander. That's ace.